There’s no question this is a very special car and that its existence has raised bar for authentic tributes everywhere. If you’re the sort of person who wants to own only the best, and understands that quality doesn’t compromise, you’re already familiar with what this Mustang has to offer. 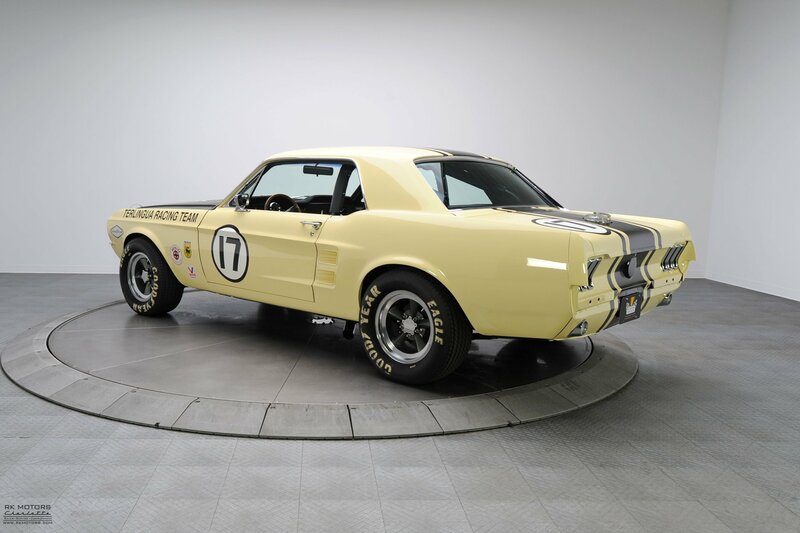 Stunning to look at, thrilling to drive, and exceptional to show, it’s a storied classic that preserves a golden era in American motorsports and accurately represents an internationally known franchise. Buy it today, and in 20 years, you’ll still be drawing crowds! 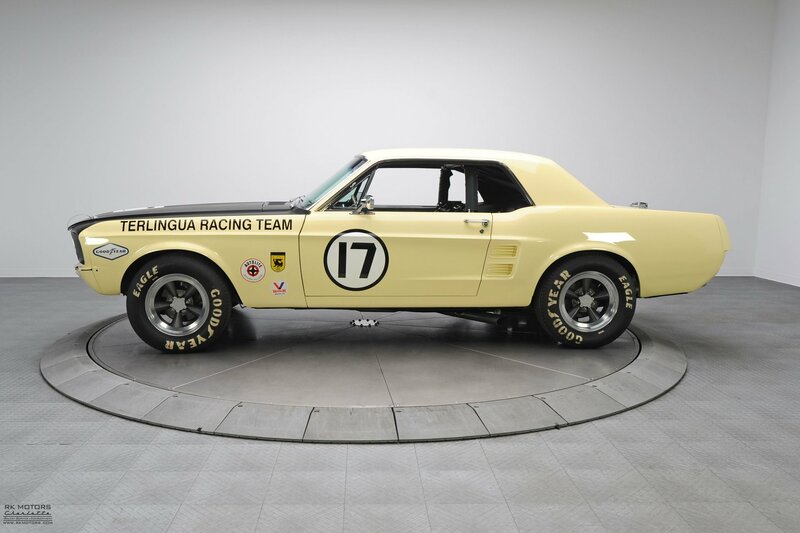 In the world of vintage racers there are cars that look good, and then there are cars like this rotisserie restored Terlingua Mustang that are wicked manifestations of classic aesthetics and track-proven technology. 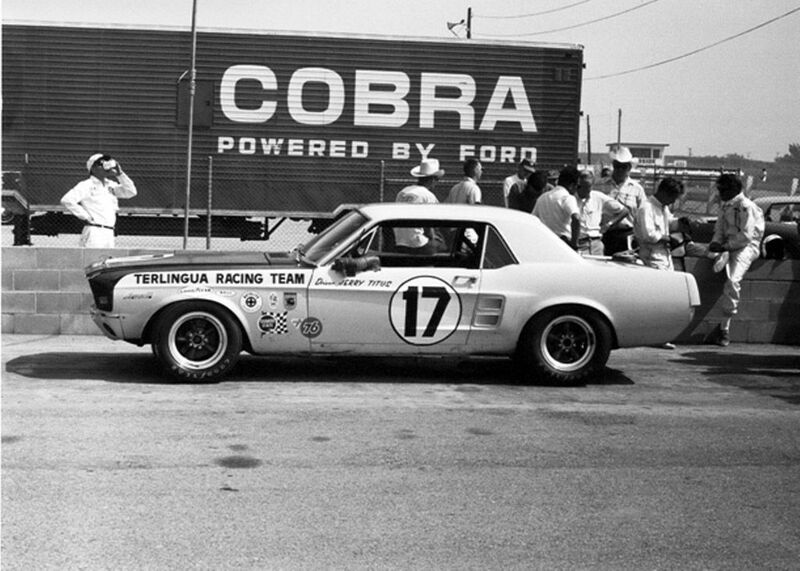 Masterfully camouflaged as a full-fledged road course veteran, and stunning in absolutely every regard, this well-done tribute is a highly accurate and very convincing replica of the hardware Carroll Shelby commanded around numerous SCCA events. 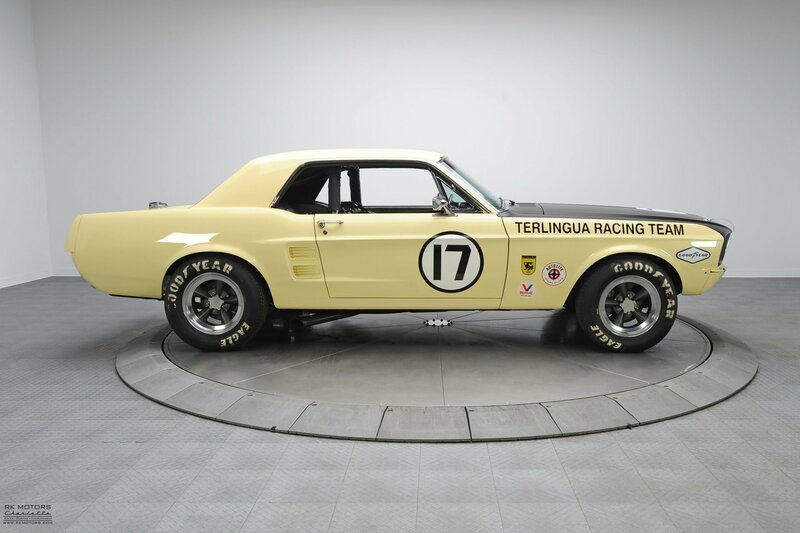 If you’re looking for a mind blowing classic that’s every bit as impressive as it is unique, this take-no-prisoners Ford is just your style!Interesting, mysterious and nowhere near as serious as the cars that took it to victory lane, the Terlingua Racing logo has appeared on a variety of top notch racers and world class trophy winners since February 14th of 1965. 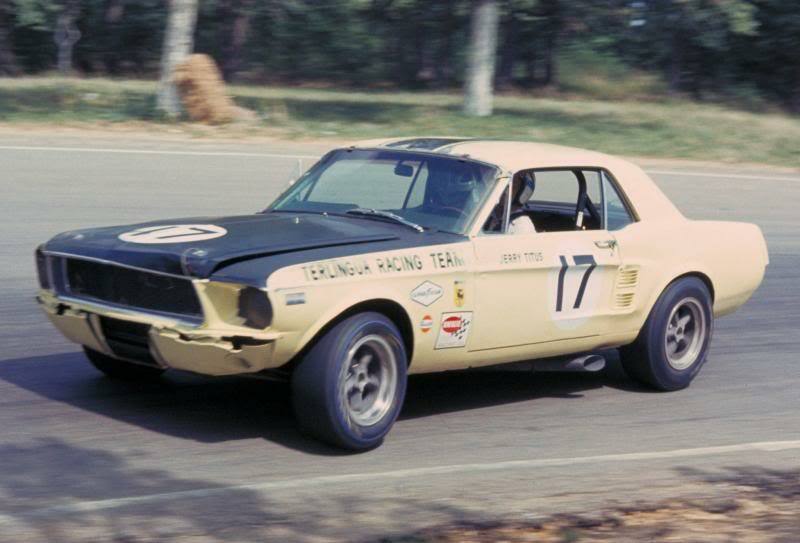 That’s when Carroll Shelby’s first R-model Mustang, a white and blue GT350, lapped Green Valley Raceway and started a global phenomenon by carrying two TRT decals to first place. However, the crest itself had already been a permanent fixture in the highest ranks of American car culture for quite some time. 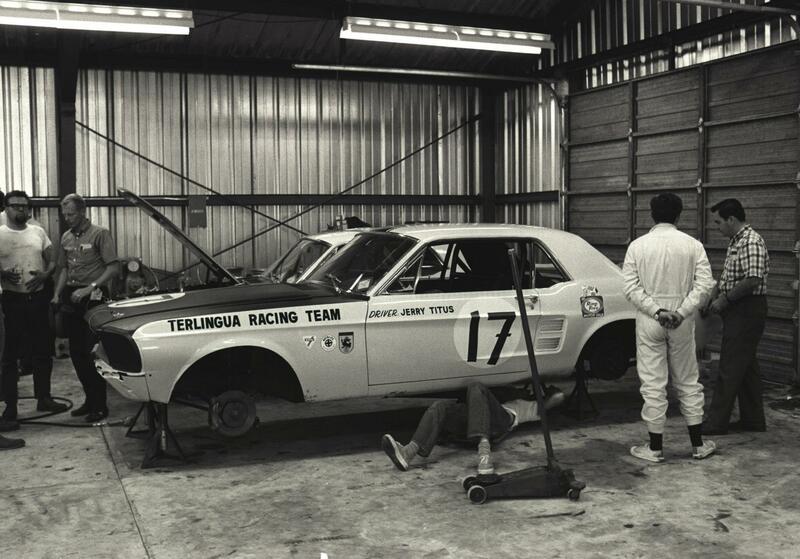 You see, a few years prior to that race, Carroll Shelby and Dave Witts decided it was a good idea to purchase a little over 200,000 acres of hunting land in the small community of Terlingua, Texas. 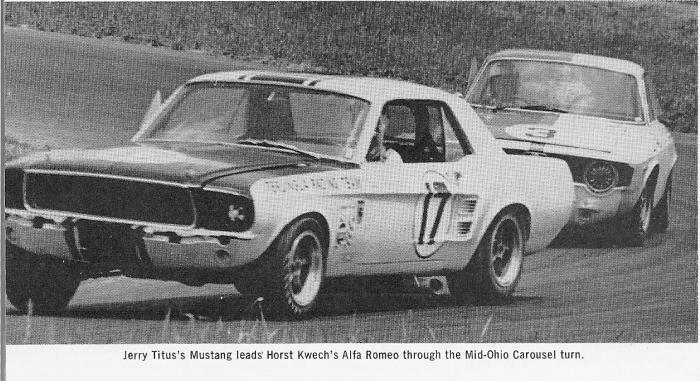 Two or three times annually a small group of gearheads, which included famed race car painter Bill Neale, would head to the Texas hills to hang out, ride motorcycles, have a few drinks and eat like kings. And eventually, the group decided it might be cool to have Neale design a fun and creative logo as a branding for the ranch. After adopting a contrasting black and yellow base, and considering various animal mascots, the Texas jackrabbit was penned as a centerpiece and positioned with his right paw in the air as to say “No more peppers in my Chili, please”; a subtle nod to the now epic and world famous chili cook-offs Terlingua hosts on a yearly basis. 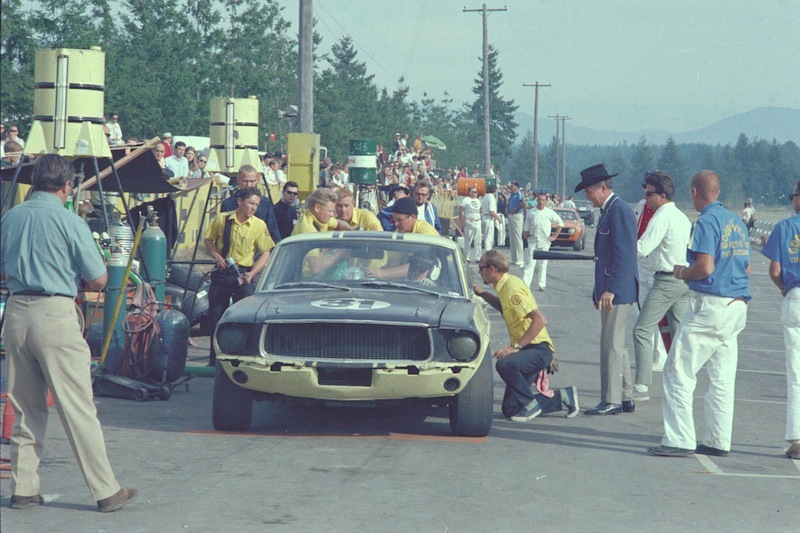 The year 1860 was incorporated to commemorate the town’s first known race, a Main Street sprint that was conducted between two six mule mercury ore wagons. Three feathers were laid below the rabbit to represent the three Native American tribes, the Kiowa, Apache and Comanche, that settled the town. The Terlingua name, which is derived from the “Tres Lingues” description of those three tribe’s languages, was emblazoned across the top. And finally, a large sun was added behind the rabbit because, in Bill Neale’s words, “it’s so bloomin’ hot down there!” Not long after the ranch logo was complete, ‘Ol Shel’ thought it might be nice to adopt it as the crest for his racing team and the rest, as they say, is history!The foundation for this awesome Terlingua Terror build was a clean and wrinkle-free body that displayed tight fit and finish, super smooth surfaces and laser-straight style lines. 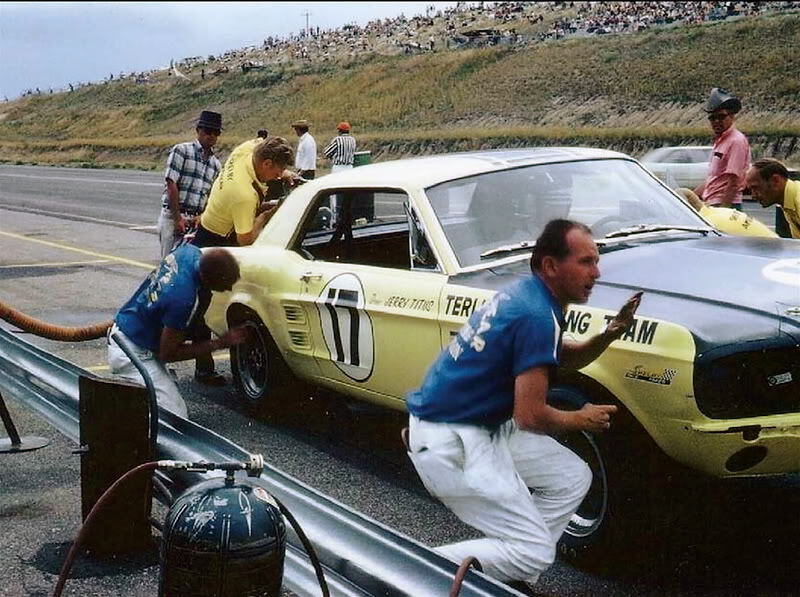 Once that top-notch body had been bolted to a rotisserie and massaged into an excellent canvas, a dynamic combination yellow and black paint, a scheme designed by Bill Neale himself, was carefully threaded into a thick and glossy clearcoat shell. The result is one lust-worthy throwback that oozes cool, looks absolutely evil and has enough aesthetic appeal to start its own parade!When I say this Mustang’s been transformed into an awesome tribute, I’m not hyping cheesy tape stripes, cheap decals and a few crude add-ons. I’m talking about an OEM-quality build that features many authentic parts, a tastefully altered profile and enough character to make even the most jaded Ford fan stop and take notice. Up front, a forward tilted grille hangs heavy duty mesh between wide-set parking lights and deep-set headlights that sport removable, authentic looking covers. At the top of that grille, a flat black hood props a bright “17” decal and standard hood pins in front of like-new glass, bright stainless trim, dulled stainless wipers and a flat black roof stripe. 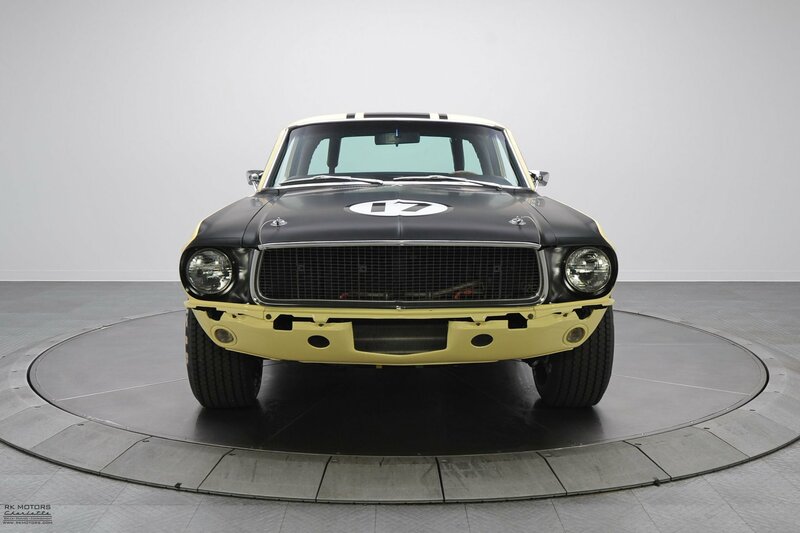 At the base of that glass ridged, aggressive fenders anchor traditional race decals and bold “TERLINGUA RACING TEAM” scripts in front of sculpted doors which feature chrome mirrors, chrome handles and two more bright “17” decals. And behind those doors, equally impressive quarters frame small, color-keyed louvers in front of a striped decklid, a fourth “17” decal, a race-ready fuel filler, segmented tail lights and chrome trimmed reverse lamps. 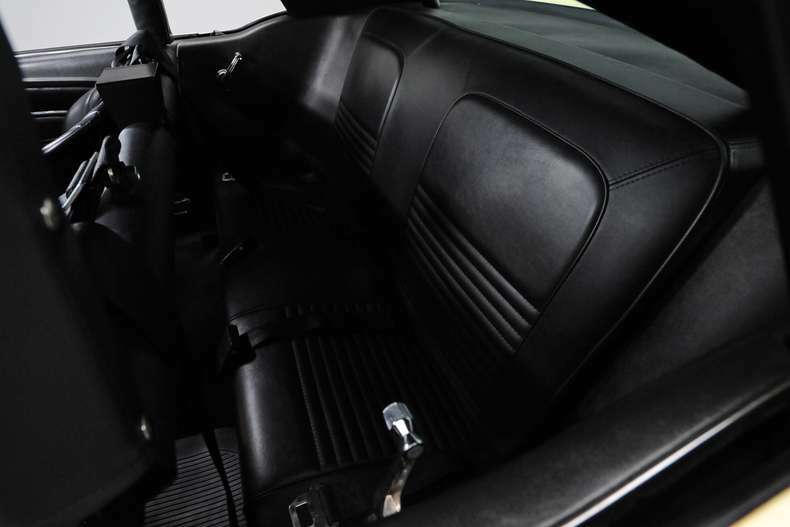 Take a peak under this car’s glare-reducing hood and you’ll find a modern 302 cubic inch Ford V8 that’s been completely rebuilt, equipped with a mild .463 lift cam and fully detailed to correct Terlingua specifications. As one of the hottest Mustang mills ever created, this highly regarded small block cranks out a ton of horsepower and runs every bit as good as its brilliant Ford Blue paint suggests! At the top of the smooth engine, a rare and original Ford dual 4V intake props two date-correct Holley carburetors under small chrome air cleaners. At the sides of that intake, stamped silver valve covers frame a traditional points distributor which shoots spark between a Pertronix performance ignition and fresh MSD Super Conductor plug wires. Below those plug wires, ceramic coated headers send spent gases into high performance, true dual pipes. And in front of those headers, an Autolite alternator perfectly complements a reproduction Autolite Sta-Ful battery, fresh FoMoCo hoses and high quality, reproduction tower clamps. As you can see, this Ford’s spotless engine bay has been sprayed in a smooth coat of satin black paint and carefully detailed with a full outfit of correct factory markings. All the motor’s proper ancillary components, from its serious, dual filter oil system to its correct Ford washer fluid bag are present and accounted for. 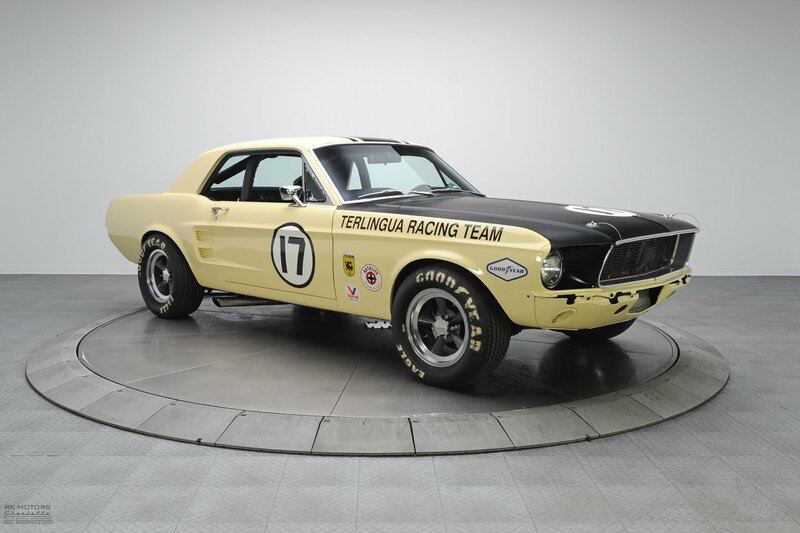 And this awesome Mustang, which is every bit as fast and potent as it was 45 years ago, is ready to hit the track as soon as it rolls out of our RK Motors Charlotte showroom! 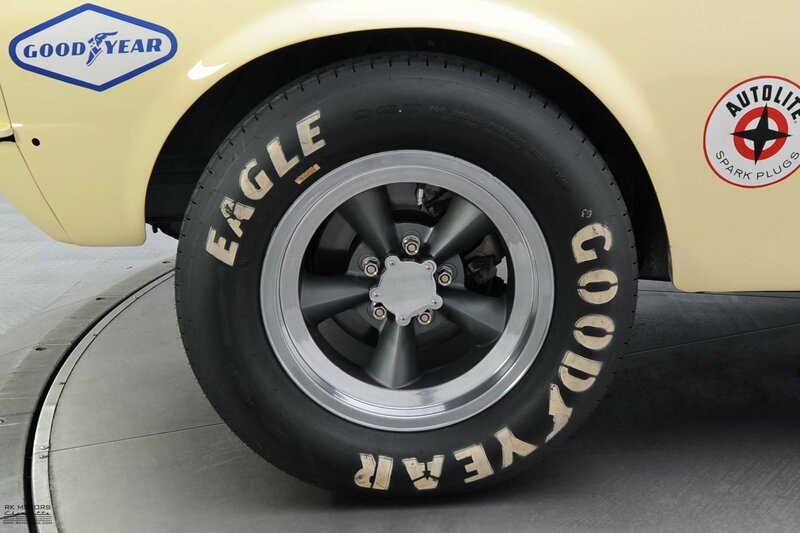 Naturally, the bottom of this clean and uber impressive Ford has been restored to the same high standards as its exterior and engine compartment. Behind the first-class Ford block, a tough Borg Warner 5-speed transmission drives a durable Ford nine inch, limited slip rear end that’s equipped with killer 4.11 gears. 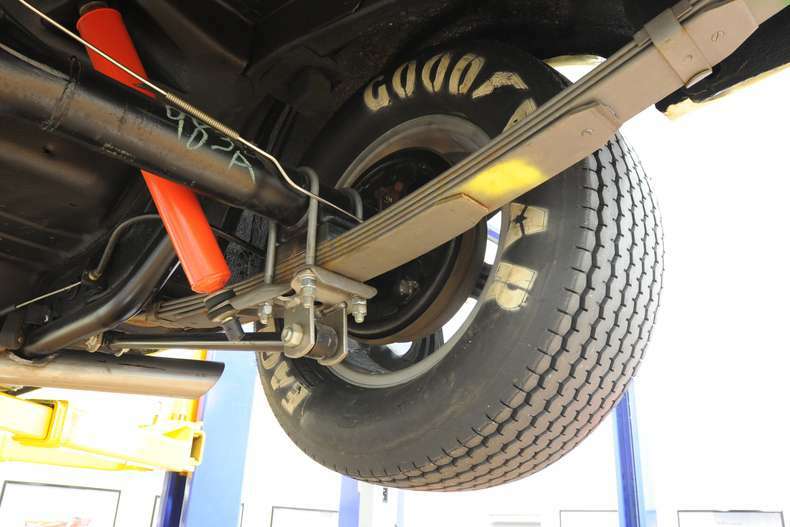 Holding that versatile drivetrain off the ground is a correctly detailed suspension that’s been completely restored, bolted to high performance Koni shocks, fitted with a 1 and 1/8th inch sway bar and braced with tubular subframe connectors. Above that suspension satin black floorpans appear new, show absolutely no signs of rust or weathering and appears as if they’re raining correct paint drips. And at the ends of that suspension, a traditional manual steering rack combines with ducted front disc and traditional rear drum brakes to provide solid stops and plenty of feedback. 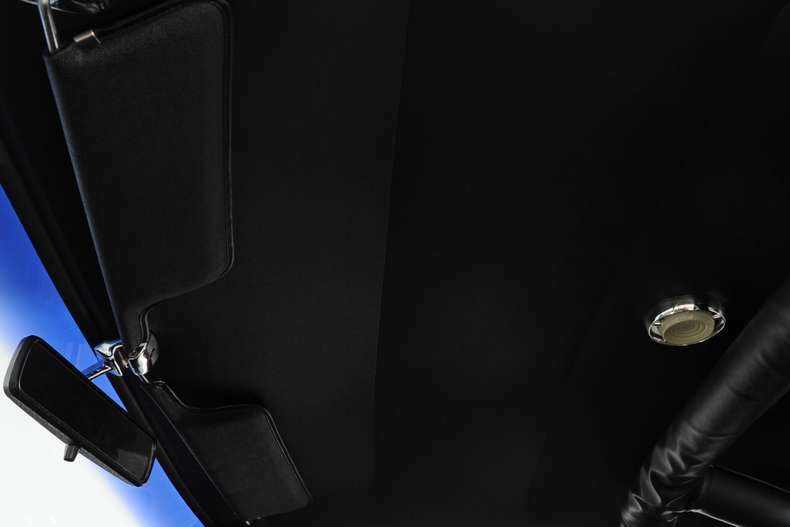 In the middle of the car’s floors, a large diameter exhaust system sends spent gas from ceramic coated headers to a straight H-pipe crossover, glasspack-style mufflers and great sounding side-exit pipes. 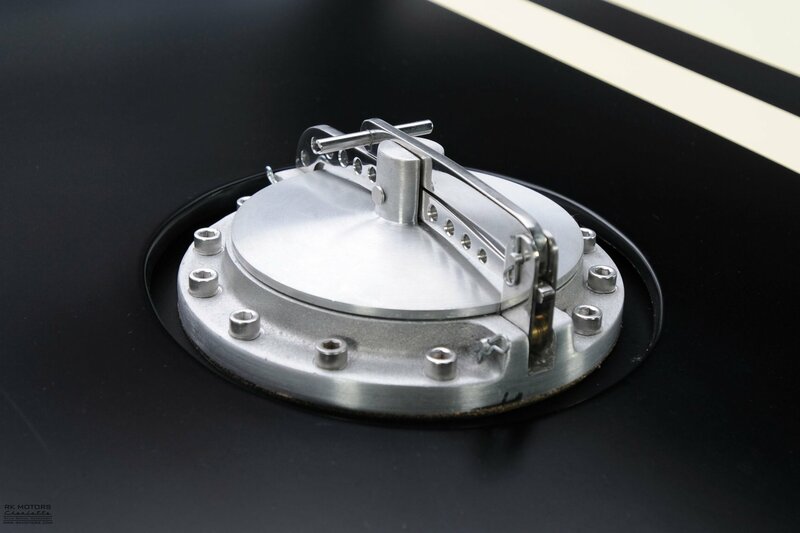 Behind those floors, a new stainless steel fuel tank ensures years of reliable cruising. And at the edges of those floors, power flows to the ground through a sweet combination of period correct Fenton Torq Thrust wheels and meaty 26.5×8.0-15 Goodyear Eagle billboards. 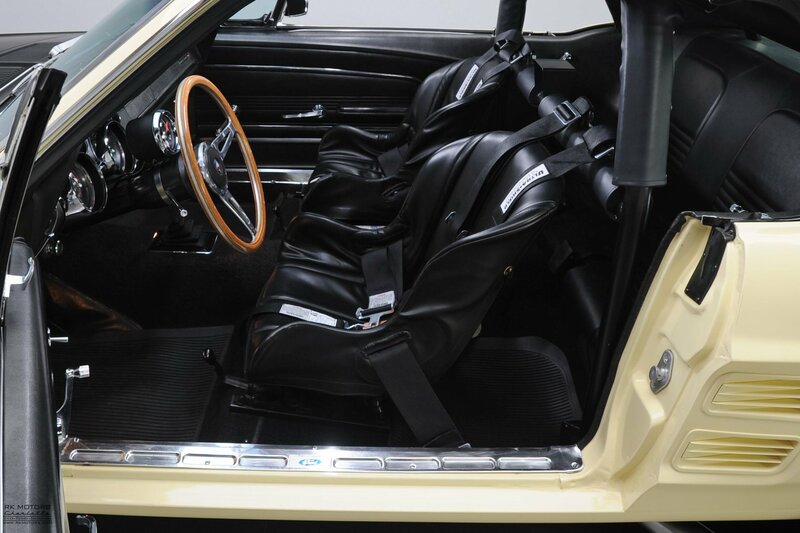 Open the door to this cool classic and you’ll find a fully restored cockpit which mixes the best elements of Ford’s stunning 60s design with correct vintage race seats, correct 5-point, Ultra-Shield harnesses and a correct 6-point rollbar. Not a fan of race seats? No worries; the car’s sale includes a fresh pair of factory front buckets that bolt right in to match its factory rear bench. In front of those seats a pristine dual cowl dash looks like it came straight out of the box yesterday morning. 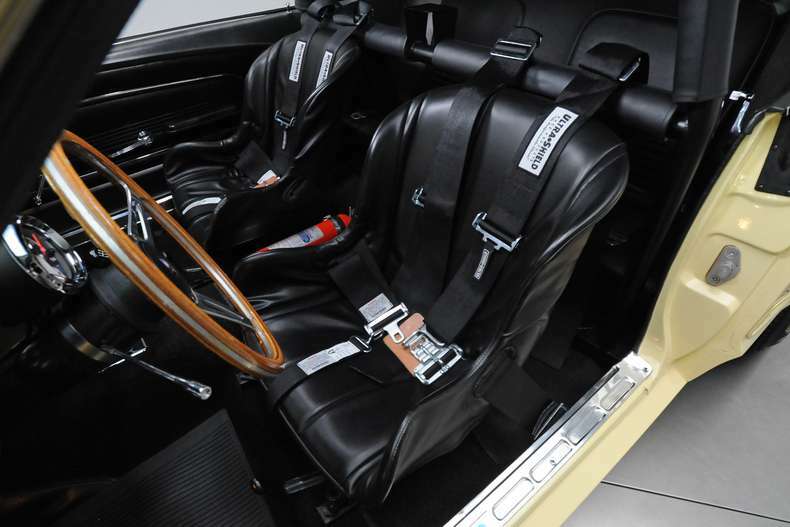 Inside that dash a bright silver instrument panel holds a full assortment of fully rebuilt gauges above new chrome knobs for the car’s accessories and an authentic Carroll Shelby autograph. Below that dash, like-new carpet props familiar, pony-branded floor mats next to stylish Shelby foot pedals, an original Ford fire extinguisher and a traditional chrome shifter. 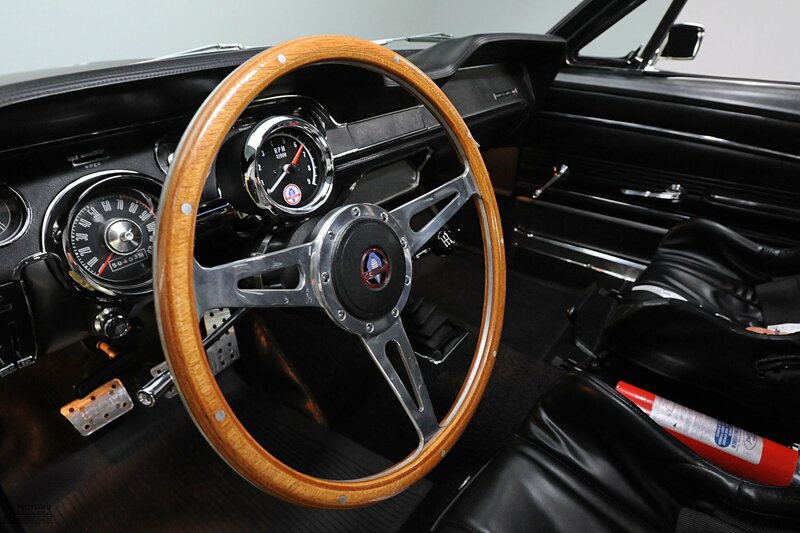 In front of the driver, a gorgeous wood-rimmed steering wheel spins three chrome spokes around a Cobra-branded tachometer and a Cobra-branded centerpiece. 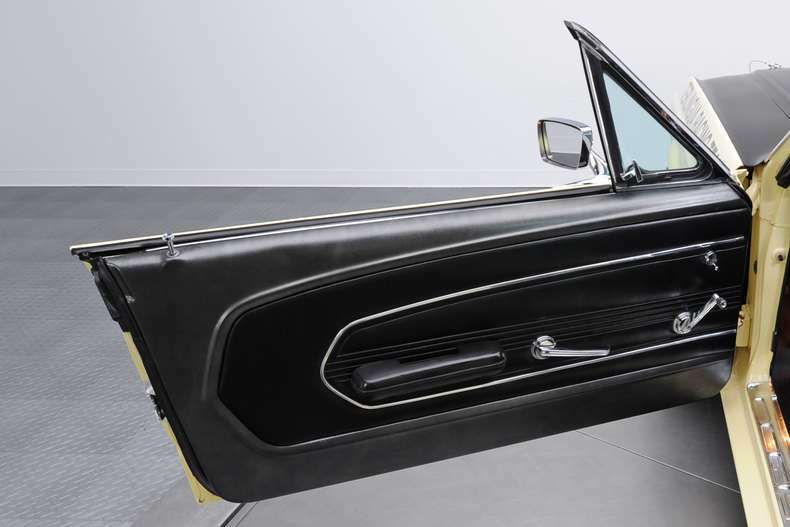 At the sides of the passenger’s, layered door panels feature pristine stainless trim, clean gray borders and new chrome handles. And behind the cabin, a fully restored trunk hangs a correctly marked decklid above fresh spatter paint and an attractive plaid mat.